There are interesting developments to report from the digital libraries frontier. The first digital-only public library, BiblioTech, will pilot in Bexar County this coming autumn. The library is designed for the digital age and will offer about 10,000 e-books to start with. Access is also provided to desktop, laptop and tablet computers as well as study spaces, meeting rooms and a designated interactive children’s area. Patrons can either borrow e-readers or bring their own (see press release for further details). No details have been released as to which e-book distribution service will be recruited, but 3M Cloud Library could well be a viable contender for the provision of the necessary technical infrastructure. The driver of this initiative, Judge Nelson W. Wolf, regards the bookless library not as an exclusive alternative, but rather as an experimental add-on to the traditional public library service. A comparative example within the academic library context would be Drexel’s Library Learning Terrace (a decentralised library in the shape of a bookless and flexible learning space that includes computers providing access to the school’s digital library resources near where graduates live and eat on campus; see Howard, 2011 for more detail). But pushing a bookless library service onto the stratified citizen, rather than then the tech-savvy student, is a more complex story altogether. For example, challenges revolve around the creation of an easily accessible technical environment that will make interaction (retrieval and borrowing etc.) with electronic books a straight forward and intuitive experience for all public users. Another issue is that of digital rights management as the business model shifts from content ownership to content licensing, i.e. e-books are not always owned when purchased by libraries. Another challenge is the potential for limited discovery of e-book content as libraries want a single, easy-to-use, easy-to-search platform: many platforms offer restricted interoperability (see for example Overdrive, 3M, ProQuest, EBSCO). Considered should also be the limitations for interlibrary loan opportunities due to potential operational limitations set by e-book vendors. Regardless, it will be interesting to see how the BiblioTech experiment pans out once it goes live. Sendze M. The E-Book Experiment. Public Libraries [serial online]. January 2012;51(1):34-37. Available from: Library, Information Science & Technology Abstracts with Full Text, Ipswich, MA. Accessed January 23, 2013. I am currently working on a research project with CIBER Research UK Ltd and the Center for Information and Communication Studies at the University of Tennessee funded by the Alfred. P. Sloan foundation examining how decisions on trust and authority in scholarly communications are being changed (or not) by developments in digital technology. We are looking at how scholars decide what to trust when searching for information and also how they judge which is the most authoritative place to publish their results. A key question is whether emerging social media channels present any real challenge to the well established high impact factor journal route to academic prestige? This links into previous debate on libfocus on the growth of altmetrics. In terms of searching for information do academics use Google as freely as we tend to assume their students do or are they relying on their own specialist sources? All these questions are important to libraries as they concern how people make the complex assessment of what defines quality information that they can trust. Changes in where scholars publish will also eventually have an effect on the type of information resources that libraries hold. The study is international but the qualitative data is being collected from the USA and UK for this phase of the research and I am interviewing academics from Northern Ireland, Scotland and Wales. I would be interested to hear from anyone who has views or experience on the topics covered by this research project. Please contact me on clare.v.thornley[at]gmail[dot]com. Further information on this project can be found at utk.edu and ciber-research.eu. The survey below might be of interest to you. Sarah and Heather are two librarians in Seattle who are doing research on innovation in libraries for an upcoming book chapter and conference presentation. If you are a librarian or library worker, we would appreciate if you could take a few moments to let us know about your experience with innovation at your library. Thank you for your time! Is innovation a priority--either explicit or implicit--in your organization? 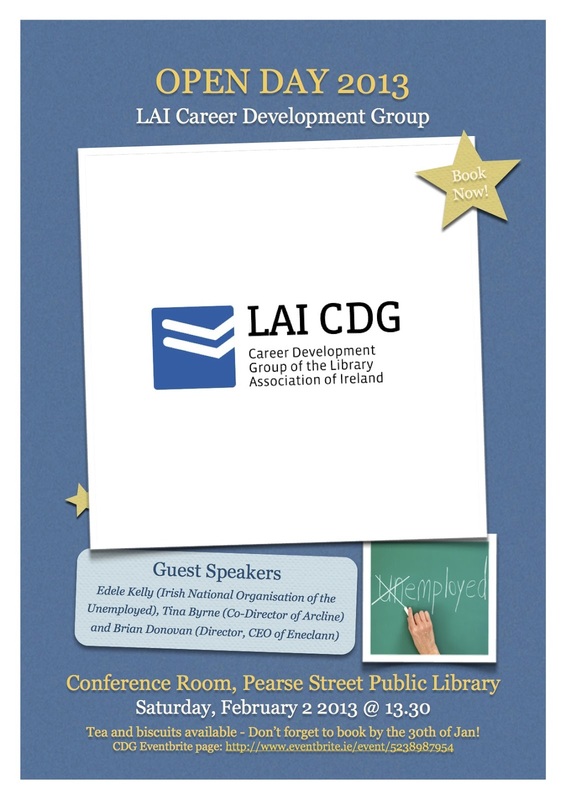 Our friends in the LAI Career Development Group are holding an open day on Saturday 2nd February in Pearse Street Library, with a great line-up of speakers (and tea, biscuits & networking!). The event is free and more details including how to register, are available on the CDG blog. RSP will run a one-hour webinar this Wednesday from 3pm - 4pm on the subject of how to go about securing IR deposits within the context of academic institutions. 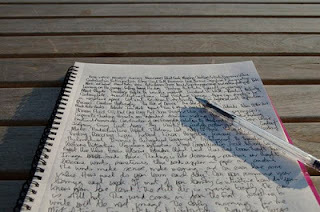 Practitioners (as authors) write primarily for practitioners, academics (as authors) write mainly for academics. As a consequence, there is a gap between the communities of LIS academics and LIS practitioners. As I librarian, I am interested not only in the role that scholarly publishing and communication plays in the broader scientific community, but also within the LIS profession itself. The theory-practice divide between LIS faculty and LIS practitioners (please forgive my use of 'librarian' as shorthand henceforth!) is something I have been thinking about a lot lately . Most librarians see their role primarily as providing a service, and this service is not producing research but rather supporting research. However, professional and personal intuition in decision-making can only take us so far, and it is difficult to expect our practice to improve and develop significantly if we do not use the best evidence available to guide and inform our approach to service delivery. How many librarians regularly read LIS journals for no particularly purpose other than to stay informed and up to date? Access to subscription resources may be a very real barrier here (particularly outside of HE institutions), but thankfully there are also some excellent OA publications these days. This of course, is the idea behind evidence-based librarianship, but without librarians conducting research themselves there would be no evidence to use (especially if Schlögl & Stock are correct in their view that academics may often neglect the issues which are most pressing for practice). However, the benefits from undertaking research accrue beyond its inherent value as a decision-making tool. Surely advice on research impact and publishing is more authentic and credible when proffered by a librarian who has experienced the challenges and intricacies of the process themselves? Moreover, research is a learning process in itself, and one which challenges the researcher to consider new perspectives and appraise existing ones, skills which are transferable to many contexts in library management. So what can be done to encourage more librarians to undertake and publish research themselves? There are of course very real barriers in this respect, and Kennedy & Brancolini provide a useful overview of some of the key issues. However, a larger consideration is perhaps who we are writing for. I believe that sometimes librarians may not give themselves enough credit, preferring to focus on more professional- or practice-based publications. Whilst there is nothing wrong with this, publishing in more scholarly publications will perhaps help to raise awareness of work-based or lower-profile issues. If practitioners worry that their primary intended audience (e.g. other librarians) won't read their work if they publish in more academic-oriented publications, perhaps there is a deeper problem here. And of course we are not just restricted to LIS publications in this regard. Cross-disciplinary research and publishing in non-LIS-specific venues might be more challenging, but the future benefit and impact may be tenfold by helping to integrate and embed our relevance in a broader context. Perhaps we should also be writing more for our users? Blogs and other social media channels can deliver obvious value in this space. After all, the more that we learn and share with our users, colleagues and the wider scientific community, the greater the value we can ultimately deliver to our communities. Schlögl, C., & Stock, W. G. (2008). Practitioners and academics as authors and readers: the case of LIS journals. Journal of Documentation, 64(5), 643-666.